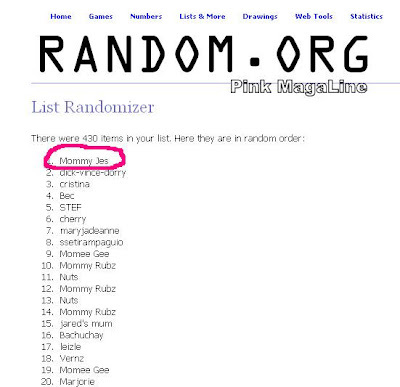 Pink MagaLine: Congrats to the Winner of My Biggest Giveaway! A few days after I posted my Pink MagaLine's Biggest Giveaway, there was one thing that bloggers battled with over the internet-- the DTI issue! Anyway, it's all over so thanks God these people realized that it's pretty crazy to secure a permit just to giveaway stuff like these. Now it's time to announce the winner. Oh, before I forget, let me express my deepest gratitude to the owner of KOTSEBOOK.COM for being my first giveaway sponsor ever. I love you man! I know this giveaway wouldn't be possible without you. 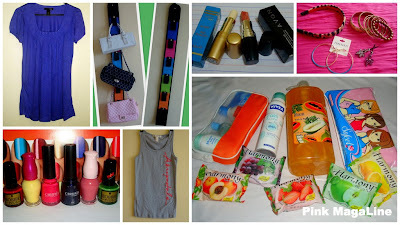 Also, thank you to you all ladies who joined this giveaway. Hope you join again next time even the giveaway is not as big as this one. And the winner is.. drum roll please..
swerte ni momi jes talaga...congrats!